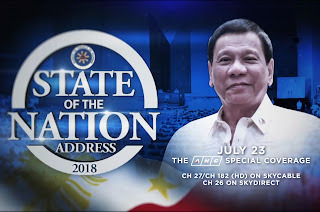 Filipinos will be able to catch President Rodrigo Duterte’s State of the Nation Address (SONA), along with news, analysis, and features related to the president’s report, on the medium of their choice as ABS-CBN News launches a multiplatform SONA 2018 special coverage on ABS-CBN, ANC, DZMM, and news.abs-cbn.com on Monday (July 23). On ABS-CBN, the SONA special will begin at 3:30 pm with anchor Karen Davila in the studio and ABS-CBN News correspondent Willard Cheng reporting LIVE from the Batasang Pambansa Complex. The SONA will be aired in full with reports on expectations and protests before the address; and reactions and analysis after the speech. On the ABS-CBN News Channel, there will be live reports from various remote points on “Early Edition,” “Headstart,” “Market Edge,” “News Now,” and “Dateline” before Tina Monzon-Palma’s exclusive interview with Speaker Pantaleon Alvarez of the House of Representatives for ANC’s “Independence” series at 1 pm. The cable news channel’s special SONA coverage will start at 3 pm with anchors Lynda Jumilla and Lexi Schulze in studio and Christian Esguerra and Karmina Constantino in Batasang Pambansa. ANC will also gather analysts, sectoral representatives, government defenders and critics in a roundtable discussion to be led by Lynda before and after the Pres. Duterte’s SONA. Meanwhile, DZMM 630 and DZMM TeleRadyo’s entire force of Radyo Patrol reporters will start reporting on SONA-related events as early as sign-on, while the special coverage kicks off at 12 nn with a special one-hour “Headline Pilipinas” anchored by Julius Babao and Toni Aquino. This will be followed by a “SONA Primer” with Ricky Rosales and Johnson Manabat at 1 pm, with Vic Lima and Gerry Baja taking over at 3 pm and 5 pm, respectively. To help break down the issues are Dr. Jean Franco and Prof. Ranjit Rye with Ding Generoso, spokesperson of the Constitutional Committee to review the 1987 Constitution. Netizens won’t be left behind as news.abs-cbn.com begins its livestream at 9 am with live reports from journalists on the ground - within and outside Congress. A pre-SONA special streams at 2 pm followed by the special coverage on ABS-CBN. For breaking news and live updates, Filipinos can follow the official Twitter accounts of ABS-CBN News, ANC, and DZMM, and view the actual SONA on the news platforms’ Facebook pages. As the largest news organization in the country, ABS-CBN News has been in the forefront of providing news and information to Filipinos especially during big events in the nation such as the SONA. More than delivering the President’s message, ABS-CBN News also aims to explain and provide context and analysis of issues to Filipinos through its panel of veteran anchors, seasoned reporters, and respected resource persons. Join the nation in witnessing President Rodrigo Duterte’s third State of the Nation Address on ABS-CBN, ANC, DZMM, and news.abs-cbn.com. Stay updated by following @ABSCBNNews, @ANCalerts, and @DZMMTeleRadyo on Facebook and Twitter. For updates, follow @abscbnpr on Twitter, Facebook, and Instagram or visit www.abscbnpr.com.